No, really. I mean it. 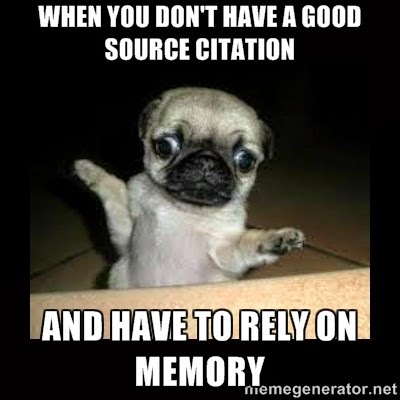 Cite your sources! So, you just found a record that finally states the parents of that elusive ancestor? Right away, without delay, cite this record as the source of this information in your database. Because you won't remember, you really won't. You think you will. We all think we will. But, when it comes right down to it, we don't. Sure, it seems so obvious now! Surely, you won't forget something as awesome and wonderful as that juicy bit of data you just found and where you found it. But you will. Oh yes, you will. We all have. Been there, done that, have the T-shirt! But, don't worry! There is a solution to this problem. We could get a biotech brain implant to store all our memories, especially genealogy sources, in "Johnny Mnemonic" style. No, wait...that's a bit extreme, and not currently available or I'd have one already! What we can really do is to cite our sources. This means we record in our database the place we found the particular bit of information. There are all kinds of discussion on the best, most correct, easiest and so on, way to do this. But in the end, *ANY* source is better than not having one at all. If, for example, I have a record for my ancestor in the 1850 census, it may very well be ideal to list off a detailed source citation. This would include where I accessed the census, which page of which census document I viewed, all the data in that record that I viewed, likely including name, relationship to head of household, age, occupation and so on. I'll be honest here, I am not likely going to do that for every 7th cousin twice removed's wife's 2nd husband's father. I may do it for direct ancestors or especially troublesome areas in my tree. But what I do try to do is include at least some source. Quite likely just a quick "1850 census" or whatever. Then, later, if someone asks about that person, and why I have that data attached to that person, I can refer back to the 1850 census and see that I listed John Smith as born about 1810 in Massachusetts or whatever because that is what the census document I viewed stated. Often, when working in my Ancestry.com tree, I just accept the automatically added citations to the documents I have attached. This is quick and easy, and would be even better if I used Family Tree Maker, but I don't. If I am reading your website or blog post about a cousin or ancestor and I see some information about John Smith that I disagree with or question and you have listed even just "1850 US census" somewhere in the write-up, I will likely find that record all on my own, without having to contact you and bother you about something trivial that may indeed seem just as obvious to me when I view that record.